Over halfway through this third pregnancy, and it's slowly sinking in that I have another baby to prepare for! As usual, I created a quick reference list of things I need for baby, as well as items I already have (from previous). This time, I decided to turn it into a PDF to share with you. Feel free to print and use it, or just reference it in creating your own list. 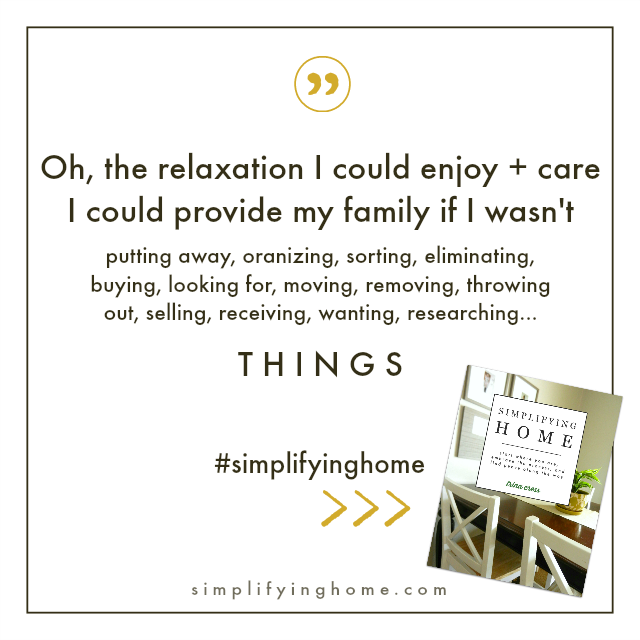 The main thing to note about my list is that I believe in simple and green living, and try to keep this in mind with bringing home baby, too. We live in a small space, and after two babies I've already seen how much excess baby stuff goes unused even if you plan carefully and intentionally. So, I try to focus on needs and differentiate those from wants. 1. Consider the option of buying secondhand. So many baby things are only used for a few months! Or less, if a parent decides they don't like that particular product or brand. You can find many like-new items for a fraction of the cost at secondhand children's stores, local kid's consignment sales, on Craigslist or local Facebook sale groups, or even from a friend or family member. 2. Start with the first 3-6 months in mind. As you get a hang of your own parenting style and preferences, you'll likely add to that as you go. No need to shop for the whole first year before baby shows up--you'll end up with more than you'll ever need or use. What one parent considers a must-have, another parent will never use. Start with the basics that make sense to you, then go from there. Now that that's out of the way, on to the checklist. 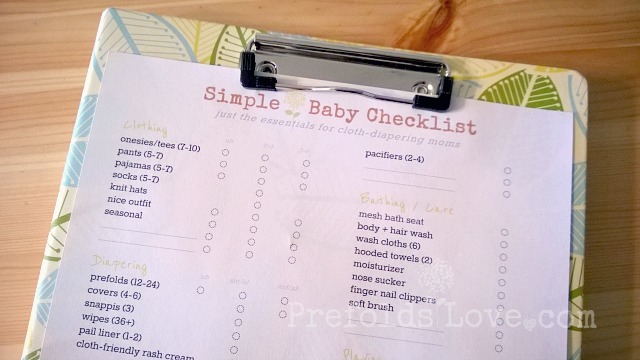 Get the printable minimalist baby checklist >> here. A good rotation of sweats, onesies, and sleepers are essential for the first six months. A total of 1-2 outfits per day for a week is a good minimum (just enough to hopefully make it to washing day if you do laundry once a week). I like to make these outfits a combination of onesies with sweats or sleepers (especially for the first three months). No need for anything too fancy when there's spit up, drool and poop involved. And don't worry too much about stocking up for a full year. Your baby may not grow with the seasons like you think. Onesies/Tees: I prefer onesies in the first six months while baby still spends most of his time laying around. (One exception being for a summer baby that might get away with a tee and a cloth diaper as an outfit.) In general, tees get scrunched up too easy on a wiggly but immobile baby. Onesies fit more secure. 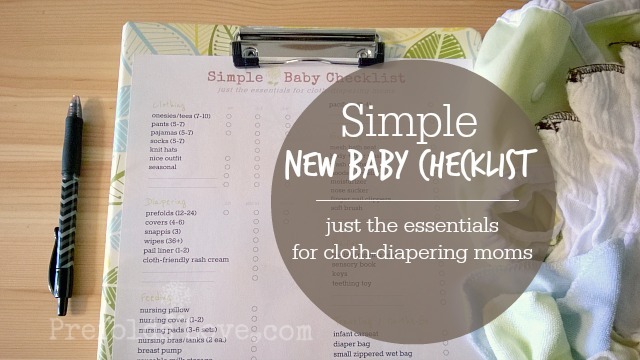 After they start crawling, then tees can be handy--especially on a cloth diapering baby. Pants: I prefer sweatpants (or leggings for a girl) for the first several months and even through the first year. Babies are still figuring out rolling over, crawling, standing--flexible cotton pants seem to get in the way less than say a more stiff pair of jeans. Pajamas: There are a variety of options when it comes to PJs--zip up, snap up, gowns with an open bottom. I prefer zip-up, because snaps or buttons can be too cumbersome by the 10th diaper change and especially in the middle of the night. The open gowns are a good theory, but when those little legs kick the gowns end up stuck around their waste too often. Babies shouldn't be put to sleep with loose blankets, so even in the summer a baby should have lightweight full-body covered pajamas to keep them warm. Socks: Some socks tend to stay on better--generally when the ankle is higher and tighter. Be prepared to lose some. Knit Hats: Fitted infant hats help keep some of their body warmth contained--important especially for newborns year round or all babies in the winter. Getting hats that fit snug and don't fall off easy can be a challenge. Generally a smaller but stretchy hat is the best option. Nice Outfit: I don't stock up on adorable, fancy outfits for tiny babies. As mentioned above, they don't lend to easily learning to move around and can look plain awkward on a tiny infant. However, we usually have at least one nice outfit for each size that they can wear to church, family photos, or another nice event. As they get older we expand this to 2-3 options. But in the beginning, one (maybe two) per size is plenty. They grow fast and these adorable outfits hardly get worn. Seasonal: The age-size connection for baby clothes is a good starting point to figuring out when they'll need warm or cold clothes. Cold season clothes would include a sweatshirt, maybe a full suit or coat and warmer hat. Warm season clothes might include a sunhat and swimsuit. If you will be using prefolds-and-covers cloth diapers, there are a few basic products that will get you set up for the first few months. Remember not to worry about building a full 2-3 year stash, because your needs or preferences could change as baby grows. See more about our newborn to six-month diaper stash >> here. Prefolds: 24 in each size is enough to get through 2+ days between washes. We have somewhat large babies, so we only have 12 newborn size prefolds, but you might want more. They can easily be used as burp cloths when they grow out of them (which might happen quicker than you think. We bought one medium just to decide when/if we would need them. We actually ended up skipping medium and buying large at around 6 months. Diaper Covers: We started with 4 size 1 covers. Once we decided that's what we liked, we bought two more. And we didn't worry about buying size 2 until we needed them, just to be sure we liked the system/brands and wanted to continue cloth diapering. Snappis: These are the new diaper pin alternative. We got a pack of 3. One is easily used over and over. It's nice to have a back-up or two in case one gets dirty with poop or is somehow lost or broken. Wipes: Baby wash cloths work great as reusable wipes for cloth diapering. We bought a couple bulk packs from discount stores like Ross and TJ Maxx for a few bucks and ended up with about 48 which was more than enough. Pail Liner: We only used one pail liner. It might be nice to have a second to rotate through them and keep the wear on them a little more balanced, but it's not essential. Along with this, a simple kitchen trash can to put the pail liner in is handy. Although there are large wet bag options that could be hung on a hook. Cloth-Friendly Rash Cream: A diaper rash or rosy bottom of some sort is inevitable whether you use cloth or disposable. We noticed far fewer rashes with cloth, but still had some rough bouts when teething (it causes terrible poop). It's important to find a brand that won't lead to build-up in your cloth diapers (build-up can lead to bad rashes or stink issues). Or get some sort of a liner to keep the cream off the diaper when needed. Check >> here to get an idea of cloth-friendly brands. We were able to manage this with our son, so I hope that success repeats with this baby. Just about everything on my feeding list revolves around breastfeeding. Your schedule and routine will dictate which items are essential. I stay home, so my needs focus on that set-up. Nursing Pillow: This isn't absolutely essential. But I had one with my son and it was handy especially in the beginning as I got adjusted to feeding. It also came in handy when I wanted him propped up a little after feedings when I laid him on a blanket on the floor. There are covers you can buy for these, but we didn't need extras so I'd buy those only as needed. Nursing Cover: Some people don't care about nursing in public or their own privacy. I, however, am a stickler for maintaining my own decency and sense of privacy. So, I faithfully used a cover when nursing in public or when we had company in our home. I have two--one that I keep in the diaper bag and one that I keep handy in the living room for when we have guests. There are some with a fancy stiff upper insert to allow you to see baby. I prefer the simple solution I got from Target that I can flatten out once baby is settled because I figure if I can see down to baby then anyone standing over me could see too. Nursing Pads: I have several sets of these that are machine washable. As supply changes leaking issues come and go. Nursing Bras/Tanks: Nursing bras are sort of a no-brainer. Some don't love the tanks. 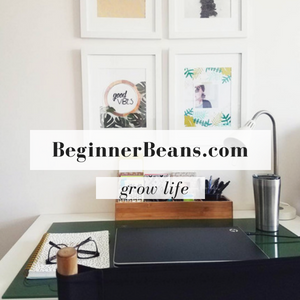 However, I found them invaluable in the beginner weeks as I was learning. I didn't want to lift my shirt, and wearing this with a light open front sweater looked nice and made the learning process much easier. Breast Pump: Because I stay home, I have been able to get away with a simple handheld breast pump. It's more affordable and compact for the occasional pumping away discomfort when engorged, or doing a semi-daily session to build up a small freezer supply for date nights or other outings where I hope to not take baby. Reusable Milk Storage: We had the freezer bags before and they worked good enough. We thought we were going to use the drop-in bottles, but ended up thawing the milk and dumping it into another bottle. This time I would like to find reusable containers that can easily be washed out and used again. Bottles: Again, because I mostly nurse, bottles are not really a daily essential. Having one or two on hand is just enough for the occasional outing when I don't take baby with me. It can also be handy to give a daily feeding over to dad or another family member to allow them time to bond, give mom a break, and even allow a little separation for sleep training. That's a good time to then pump to replace that supply. Burp Cloths: We use prefolds (newborn or small, depending on which are not currently being used as diapers) as burp cloths. So far, we have had two big spitters, and prefolds work the absolute best at absorbing all that mess. Bibs: Even before baby starts solids, cotton bibs are handy for catching before-mentioned spit-up or the teething-induced drool. Without this little catcher, clothing changes might be more frequent and a bib is easier to switch out than a onesie. What you need for sleeping will be dependent on if you co-sleep, etc. Play Yard w/ Bassinet: We keep baby in a play yard bassinet in our room for the first few weeks, then transition them to a regular crib. The play yard folds away easily and serves many purposes including accommodating overnight guests w/ a toddler, a friend's napping babe, or when going away with baby overnight. I imagine I'll keep one on hand even after our kids all get too big for it. Some come with a changing attachment, but we've always been happy with the simple versions that don't have that. Crib and Play Yard Sheets: Two is a minimum sheet rotation so there is a clean one on the bed while one is in the wash (since baby naps throughout the day). A third can come in handy if one has been soiled in the middle of the night when one is in the wash.
Swaddling Blankets: Simple swaddling has been our go-to solution for getting our newborns to sleep. We even did it with Ian until he could roll over. Many blankets labeled as swaddling blankets (especially Gerber brand) are not actually large or stretchy enough to be very functional on an average size baby. Our favorites were homemade by my grandma out of large pieces of flannel fabric. I've also heard great things about the Aden and Anais brand. Blankets: Babies shouldn't be put to sleep with loose blankets (which is why good sleepers and pajamas are essential). But they come in handy for covering the carseat when it's cold or laying on the floor for tummy time. It's easy to get overwhelmed by blankets given as gifts, so I try to keep ours paired down to one soft/fuzzy blanket (the kids end up sleeping with these for years), and a quilt or two (we've been blessed by receiving them homemade from family and friends). Quilts especially work great for laying on the floor or grass for play time. Pacifiers: Some people are against pacifiers, and that's fine. We are very much for them (especially if it keeps baby from sucking on a thumb or demanding to nurse simply to pacify). However our son refused to take one--and we tried many brands. He ended up nursing to pacify far too much and this led me to wake up and nurse him a couple times a night for a whole year. Even breastfed babies can eventually sleep through the night without needing night feedings, so I would like to try the pacifier route again. The bath essentials are pretty straight forward: soap and towel. There are, of course, a few other items that help this process. Infant Bath: There is quite a variety of bath options available. We have used a simple, affordable mesh bath seat with our first two and will do the same with this. It's small enough to store away easily, dries quickly, and works at keeping baby supported at an incline in the regular bath tub. Wash + Lotion: Two of our favorite baby care brands include Burt's Bees and California Baby. There are quite a few more natural brands becoming popular. Just be careful, because not everything labeled natural (i.e., Johnson & Johnson and Aveeno) are always the most natural. Consider checking specific brands and products on the >> Cosmetic Database to get an idea of their hazard ratings before settling into your favorite products. Wash Cloths: We use our colored baby wash cloths as cloth wipes, then we have several white infant wash cloths that we actually use for the bath. This helps us keep them separate. Hooded Towels: Sure, you could use a regular towel. But the hooded ones fit them better and are actually easier to wrap them up and dry them off. Just pay attention, some of the cheaper ones are very thin which make them not very effective in drying baby off or keeping him warm. Nose Suction: I think "bulb syringe" might be a more proper term. The ones they give you from the hospital are by far the most effective at clearing baby's nose. They are so handy in that first year to keep baby clear of common sniffles, or even clearing nose after bath. What you find in the store is just not as effective. There are photos going around online of someone that cut one open and found mold and such inside. That is absolutely a possibility (same with some bath toys, so be cautious with those). We aren't ever blowing this into babies face or nose, just simply sucking the gunk out, so I am not too bothered by these. There are options (like the "nasal aspirator") that are supposed to be a little easier to clean if you'd rather that option. Nail Clippers: I avoid clipping baby fingernails and am so thankful my husband takes this task on. The baby version are essential to avoid hurting baby's tiny fingers. Soft Brush: My first reaction to baby brushes was, "what's the point?" Then, I realized that cradle cap and other dry skin problems are common in babies, and a soft brush is perfect for brushing the scalp and working this flaking skin out. Babies don't need much to entertain them, and they certainly don't need a variety of battery-operated toys. A few basic options as they grow will suffice. Start with these basics, then as they grow you can easily add in wood blocks, balls, etc. Inclined/Moving Seat: We usually choose one basic inclined-moving seat. With Brylee that was a bouncy seat and with Ian that was a swing. We're still deciding what we'll get for this baby. Parents will say some babies have a preference, although we've found if you just choose one they won't really know the other options exist. It's handy to have a safe place to keep them a little inclined and off the floor when needed, especially right after baby eats. The moving, bouncing, vibrating, etc. is a bonus attempt at soothing. Sensory Books: Especially look for a couple options that can withstand getting wet with saliva. There are some with rattles or mirrors or even little tags meant to put in their mouth. And if there are simple words that you can sometimes read to them, all the better for giving them an early start to books and reading. Keys: Basic baby keys or other jingly toy that can be put in their mouth or rattled around. Teething Toy: Something basic like a ring or even the squeaky giraffe that can be chewed on without breaking apart. There are some essentials that help make taking baby on-the-go a little bit easier. Carseat: Some people aren't sure whether to get an infant seat (that can be easily carried in and out of the car) or a convertible seat (that stays seat-belted into the car and can switch from rear-facing to forward-facing) or both. We personally like using the rear-facing infant seat for the first year. In the first few months, it's so handy to keep baby secured in the seat as we transfer them inside and outside and even hook onto our jogger stroller when they're too little to be secure in the stroller. As they get older, we just take them out of the carseat and leave it secured in the car. Then, when they grow out of the rear-facing, we upgrade to a forward-facing seat. But we worry about that when the time comes (usually between 12-24 months; read up on it and check your state's carseat laws). Diaper Bag: I love keeping a basic canvas "mom bag." My favorite was only $12 at Target, washes easily, has side pockets for quick access items, and holds all my essentials (including cloth diaper stuff) without being too bulky or heavy. If you need to, buy a few and put all your stuff in and see what you think. Return whichever aren't what you need. Zippered Wet Bag: I put this under travel instead of diapering because it's only essential on-the-go. Even if you don't use cloth diapers when out-and-about, this can still come in handy to put soiled clothes, bibs or burp cloths until you get home. Carrier/Sling: This is a personal preference area where everyone swears by a different product. It partly depends on your needs and how you'll be using it. For instance... Our Moby is super comfortable, but is long and a little complex to get right. The Ergo is also really comfortable and sturdy (and can last from newborn up to 65 lbs! ), but is also bulky and not easy to throw in a diaper bag. So, I recently bought a simple option from Seven Slings. I'm hoping this will be a simple solution that I can keep in my diaper bag for quick and easy use. We will see. I'll share a review of these three options after baby is born. Stroller: A few things to keep in mind when choosing a stroller include how and where you'll be using and where it will be stored. We chose a Baby Trend jogger that we keep stored in the back of our car. It has a swivel wheel that makes it easy to maneuver even in tight mall stores, but also has sturdy tires that work great outdoors on basic trails. There has been a time or two where I've wondered if we needed a smaller umbrella type stroller, but two kids in it hasn't been essential. And anytime we have borrowed someone else's compact stroller, we're usually frustrated by how difficult it is to steer and push. By this point there might have been quite a few smaller details I have forgotten. But that's the beauty of starting with the essentials, is there is always room to add in more as necessary. I'd rather start with the basics with room to add. Here are a few other miscellaneous and nursery items. Rocking Chair: A gliding rocker is not necessarily essential. But it is so handy to have some sort of moving chair to sit in with baby. We didn't have one with Brylee and survived just fine. With Ian, I got the Poang chair from IKEA and that is also what we will be using with this third baby. It bounces just enough to move a little when cuddling with a fussy baby. Changing Table + Pad: If space really doesn't allow, then you wouldn't need a changing table. Baby can be changed on a bed or the floor or wherever is easiest. However, if there is space, it is handy to change baby while standing. We generally use the changing table for the first 6-9 months, then when baby starts moving a lot, it's easier for me to spread out on the floor. Clothing Storage: Depending on the size of your nursery (or wherever baby will be sleeping), a dresser is not essential. Baby clothes are small and we keep them to the basics, so we use hanging closet organizers even now as the kids are older. Even a bookshelf with bins or another solution can easily work for storing baby clothes. Get creative and fill this need however suits you best. Empty Tub(s): We actually started with two empty tubs. One is to keep those very few keepsake items that we'll likely hang onto for a long time. This holds things like sonograms, baptismal certificates, cute newborn or 0-3 outfit, and even special artwork as the kids get older. The other tub is for clothes that baby will grow into, and/or for clothes that are still in good condition that baby outgrew and can be sold or handed on to a friend or family member (or kept for a possible next baby if your family is still growing). "It's Been" Bracelet or Timer: There is an Itzbeen timer, a MilkBands nursing bracelet or even various smart phone apps. The point is that they tell you how long it's been since baby ate (and which side they ate on if they're breastfeeding), and some even have a way to check wet or poopy diapers, sleep, etc. We have survived raising two babies without any such thing, so this is likely a nice-to-have and not a necessity. However, it would come in handy to have some accountable when I'm tired and have lost track of time. Sometimes I have a hard time realizing baby just ate and I shouldn't feed again just because he is crying--but I'm too tired to realize he's actually crying because it's tired. Having a way to keep track of this time and nursing routine, etc. might help get into a better routine. Also, there are times when tracking wet/soiled diapers can help make sure baby is getting enough and a doctor might even ask at check-ups or if baby is sick. Every parent forms their own list of must-have and non-essential items after having their own baby. Each has their own reasons for loving or hating certain items. Above is what I consider my essentials list. Below are a few items that we've learned are non-essential for us. But these just might matter to some of you... that's all part of your journey into parenthood and finding what works for you and what's not worth the time, money or effort. Wipes or Bottle Warmer: These are specialty items that I'd really consider if you care before jumping into buying them. We have never used a wipes warmer and our babies survived just fine, and even managed diaper changes without crying about a cold (or likely room temperature) wipe on their bottom. If you're primarily bottle-feeding, then a bottle warmer might be a little more useful. But we exclusively bottle-fed our first baby without one and got along just fine, so I wouldn't call it a need. Baby Monitor: We owned a baby monitor that I finally got rid of after our second baby because we never used it. If you have a large house or are hard of hearing, then a monitor might be handy. Or maybe you just really want to always be able to see or hear baby--no problem. But no need to feel like a bad parent if you decide to forgo this accessory. Shoes: We don't worry about buying our babies shoes until they're walking, or at least starting to learn to pull themselves up. Before that, shoes just tend to fall off and seem a little unnecessary. Bedding: Despite all of the warnings not to put any lose bedding around baby, nursery sets still include blankets and bumpers and all that jazz. They look cute, but can actually cause sleeping hazards for baby. We keep our crib fitted with a sheet, and that's it. A theme can be worked throughout the room in other ways. Bath Toys: Baths are for bathing, especially in the first few months. As baby gets older it might be nice to give them a little playtime in the tub, but this can usually be done with some of their infant toys (because we choose those for their saliva-proof qualities). Even as our kids have gotten older, we've kept bath toys to a minimum with a few rings, foam-type letters that stick to the side of the tub, and a larger toy each (frog for Ian and mermaid for Brylee). Mixing bowls, measuring cups, spoons, and other household items also make great bath toys if you really want to give your kid playtime in the tub. Items for 6+ Months: Before baby arrives, I focus on buying all the essentials for the first 6 months. I make sure we have enough clothes and diapers and other items I think we'll need in those first few months. Through showers and other gifts we might end up with clothing and other things that we'll use beyond six months, and that's okay. But I don't make that my focus before baby arrives. I like to give myself room to decide what I'll need later, after I've gotten to know what our needs are for this particular baby and this particular season in our lives. Print your simple prefolds and covers new baby list >> here. What are your must-have products? And what have you found non-essential?